This is kind of interesting. Ordinarily, this car would not get a mention in this blog. Not that there's anything wrong with a 1976 Corvette, they're nice cars, it's just that they're pretty common. This one has something that makes it slightly uncommon; an aftermarket rear hatch. I've never seen a Corvette with one of these. I e-mailed the seller who didn't recall where it came from. A search on the internet turned up nothing. I really like the way this looks. It gives the back end a more finished look. As shown in the picture below, Chevy once toyed with a similar idea with the "Kamm Back". I think the hatch on the car for sale looks better. If you're in the market for a mid-seventies Corvette, this one may be worth checking out. The seller states that it's in good condition. 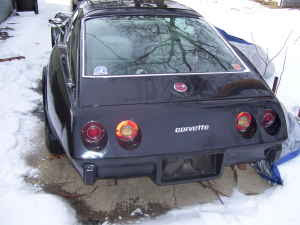 With the rear hatch you can be assured that it won't look like every other Corvette at your weekend car show. Although the car is a TMU (True Mileage Unknown) car, parts are relatively cheap and easy to get for a Corvette. If it runs and drives like the seller says it does, buy it and don't worry about the mileage. At $3995.00 it's a bargain. Located in Springfield, MA, click here to see the Craigslist listing for this car.